These is an answer – the Bokashi composting system. Bokashi is a system of processing food scraps that is based on fermentation. Layers of food scraps are placed in a sealed airtight container and covered with bran or a similar material which has been inoculated with anaerobic fermentation microbes. These microbes are anaerobic which means they live in environments with no oxygen, and they ferment or pickle the food scraps. The fermented food is then dug into the soil or placed in the compost heap where it becomes rich, dark soil. It can even be added to your worm farm (in small amounts at first so the worms get used to it). It’s nothing new, we’re all familiar with the process, it’s similar to how we use a ‘culture’ of fermentation microbes to produce fermented foods such as yogurt, sauerkraut, kombucha, kefir and sourdough bread, only in this case were processing (fermenting) food waste. This technique of processing waste using fermentation is based on an ancient practise of Japanese farmers from centuries ago. The farmers covered their food waste with rich local soil that contained microorganisms which fermented the waste. After the waste had fermented for a few weeks, they would bury it in the ground, where waste would turn into nutrient-rich soil in a few weeks later. The bokashi system ferments organic waste, so it’s different to composting or worm farm vermicomposting. You can use the bokashi system to pre-process food waste that normally can’t go into your compost bin and worm farm so it can be used there after it is processed. Since fermentation is much faster than composting, the bokashi system can produce fermented material in one week, that breaks down quickly when dug into the soil. When in the ground, the fermented material breaks down into soil in 4-6 weeks. Ideally, from start to finish, you can turn raw kitchen scraps into soil that can be used for plants in 30-45 days. The process is more efficient than traditional composting because there’s less work to do. There is no need to get the correct ratio of green (nitrogen-rich) and brown (carbon-rich) materials, just add the food scraps as they’re produced. The bokashi system doesn’t need the regular turning that is required with traditional composting, you just leave it to do its thing. Another advantage of the bokashi system is that it’s all very clean, the bokashi container is usually kept in the kitchen in an convenient location so you can add food waste easily. Since the whole system works in a closed container without oxygen, there are no issues with odours, pests and it never gets hot like a compost pile either. The design of a bokashi container is quite simple, it consists of a container with an airtight lid, which has a tap at the bottom to allow liquid out. Inside, there’s a plastic mesh or grill that is supported above the bottom of the container, which allows liquids released by the fermenting food to drain through to the bottom, and also stops the waste from falling into the liquid and becoming waterlogged. Bokashi containers can be purchased in various sizes or homemade, though DIY versions are a bit tricky to construct because the whole system has to be airtight. In a nutshell, this system is very easy to use. Food waste is added as it is produced into the container, and a thin layer of the bokashi medium containing the fermentation microbes is then sprinkled over it at the end of the day. The bokashi medium consists of crushed grain mixed with molasses and inoculated with natural beneficial microbes which ferment the food waste, this is the ‘culture’ that you add to the food waste. It’s easier to just buy this, and it’s quite cost effective, though some people purchase the bokashi microbes in a liquid called EM Bokashi (Effective Microorganisms Bokashi) along with bulk quantities of molasses and oats (which can be found in stock feed suppliers where you buy food for farm animals) and produce their own bokashi medium. I find it’s just easier to purchase it pre-made, it last a long while, and I figure you’d need a really huge family or small community to create enough waste to need bulk quantities of bokashi medium. The bokashi medium comes in various sized bags, the 5L bag pictured below is enough for 50-65 applications and will last for many months (see the Useful Hints and Tips below!). Once the bin is full, it’s allowed to sit for a week, then the fermented waste is ready to be used. It can be dug into the soil or used in a variety of ways. It’s important to remember that the waste will still look the same, but it will be pickled so it will break down very fast in the soil and won’t attract pests. The end product has a reasonably pleasant fermented small looks like it has a clean white mould growing through it. Keep your bokashi container close to the location where food waste is produced for convenience of use, such as in the kitchen. As you produce food waste you can put it straight into the bokashi container rather than throwing it out with landfill waste. Always keep the lid on as the microorganisms require an airtight container to do their work, and you won’t smell anything fermenting that way either. Sprinkle one-third of a cup (75-100ml) of bokashi mix on the plastic grate or mesh at the bottom of the bokashi container to get it ready to accept food waste. Add food waste into the bokashi container. At the end of each day (assuming you’ve added a reasonable quantity of food waste), compress the food waste with a potato masher or any other way to remove air pockets, and then sprinkle one-third of a cup (75-100ml) of bokashi mix over it. Continue the process until the bokashi container is full. Drain the liquid from the bokashi container when enough of it is produced. You can drain it once or twice a week if the ingredients you add are fairly moist. To use the liquid, which is filled with nutrients and beneficial microorganisms, dilute it 1:100 with water (e.g. 10ml into 1 litre of water, or 100ml of liquid into a 10L watering can of water, and then water the plants in your garden with the diluted liquid. NOTE: Once the liquid is drained from the bokashi container, it MUST be used within 12 hours! Once the bokashi container is full, the contents can be emptied into the garden, compost bin, worm farm or into a bokashi soil generator. – When digging the processed bokashi waste into the garden, dig a hole or trench around 20-30cm (8”-12”) deep, empty the contents in and cover with soil. – In the compost pile, make a hole in the existing compost materials, empty contents, then cover with compost materials. – With worm farms, add contents to one side of the bedding so worms can move to the other side if they don’t like it. Only add small amounts at first so the worms get used to it, don’t keep adding processed bokashi contents to fill the worm farm. Once emptied, rinse out the bokashi container with water (do not use detergent or soap), tip it over to drain and dry, then repeat the process. Here is a collection of helpful hints and tips drawn from my own personal experience which you’ll find work really well. Use two bokashi containers – when one is filled, it can be allowed to sit for a week to process the waste completely, while the second one can start being filled. This is my Ecorganics 20 litre Eco Bucket that I use at home. I use two of these in the kitchen, this way no food material goes into the rubbish bin! 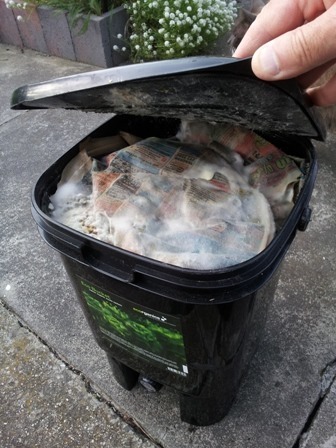 Line your container with newspaper for easier cleaning – the newspaper adds further organic material which will be broken down and also contributes stable carbon material to your soil, which helps improve soil structure, water retention and drainage. Newspaper-lined bokashi bucket ready to accept food waste. I use a recycled food-grade plastic bucket with lid to hold bokashi medium if the bag resealable tears. Lightly compress down the food waste to remove air and fit more in – this is a really good practice, but how do you compress the waste down? Some kits come with a potato masher which works reasonably well to press do the job, but I hate cleaning it afterwards, so I came up with an easier solution. Fold a sheet of newspaper to the size of the opening, lay it on top of the food waste, and press down smoothly and gently with both hands, and leave the newspaper sheet in there. It’s fast and efficient, and since takes about a second it’s fast enough so that nothing seeps through the newspaper! Add enough bokashi medium to match the amount of food you add – this helps to make the bokashi medium last longer, that way a big bag of the stuff can last for months. Don’t sprinkle the complete third of a cup as directed over the food waste if you’ve barely added any food at the end of the day, that’s just wasteful. A very light sprinkling will usually suffice. Don’t dig your no-dig garden!– If you practice no-dig gardening like I do, then don’t dig up your garden beds to empty the completed processed bokashi food waste into, dig holes or trenches in the paths between the garden beds and put the contents of your bokashi container there instead. Plant roots will reach out from the garden beds and take as much nutrients as they need. Don’t waste water and nutrients – When washing out the bokashi container I rinse mine out over the lawn with a hose so any nutrients and water don’t get wasted, they go back into the soil. The bokashi system is a great way to process a wide variety of food waste indoors, and can make a household even more sustainable by ensuring that almost no food waste is thrown into the regular waste bin, it’s definitely worth a try! Great article thanks! How long do bones take to break down? I’m worried my dog might dig up the bones and eat them if I bury them. Maybe I don’t understand correctly, but it doesn’t seem quite practical if it’s so small and once full it cannot be opened for days. We are a household of six, I’m not sure this would keep up with us. Having to order the microorganisms to complete the fermenting process also doesn’t seem sustainable. We’ll be sticking with our chickens, compost and worms. I thank you for the review! Hi Melissa, unfortunately you’ve completely misunderstood the article! Garden prunings and clippings are what go into your compost, these are high volume materials. Fruit and vegetable kitchen scraps go into your worm farm, there will be a much lower volume of these that can be managed by the appropriately sized worm farm to suit your needs. I have a Scottish Terrier and he has taken to digging up the compost with the Bokashi in it. Would it work if I started the compost in a large bin instead of in the garden by adding the fermented Bokashi and soil and leaving it until there is no smell before adding to my compost? What happens if I add liquid food waste to bokashi bin? I wonder if I can put the waste that you normally put in your compost pile (garden prunings and clippings) or worm farm (fruit and vegetable kitchen scraps) into the bocashi composter. Hi Ramon, fruit and vegetable kitchen scraps intended for the worm farm can definitely go into a bokashi composter, but garden prunings and clippings are not suitable for putting in a bokashi system, put those into the compost instead. Thanks for a great article, I’m in my first few weeks of bokashi binning! My bran was sent in a paper type bag, i did wonder about this. I shall move it into something else I think. That’s definitely a good idea, put your bokashi bran in an airtight container.